Luke Burgoa is an ex-Marine on a solitary covert mission to infiltrate the Basque separatist organization ETA in Spain and help bring down its military commander, Peru Madariaga. Luke hails from a Basque ancestry that came with the Spanish empire to Cuba, Argentina, Mexico, and, seventy-five years ago, to a Texas ranch. Neighbors consider the Burgoas Mexican immigrants and exiles of that nation’s revolution, but the matriarch of the family speaks the ancient language Euskera and honors traditions of the old country. Luke’s orders are to sell guns to the ETA and lure Peru into a trap. Instead he falls in love with Peru’s estranged wife, Ysolina, who lives in Paris and pursues a doctorate about an Inquisition-driven witchcraft frenzy in her native land. From the day they cross the border into the Basque Pyrenees, their love affair on the run conveys the beauty, sensuality, exoticism, and violence of an ancient homeland cut in two by Spain and France. Their trajectory puts Luke, Ysolina, and Peru on a collision course with each other and the famed American architect Frank Gehry, whose construction of a Guggenheim art museum seeks to transform the Basque city of Bilbao, a decrepit industrial backwater haunted by the Spanish Civil War—and a hotbed of ETA extremism. 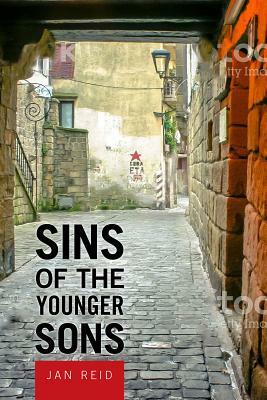 Ranging from the Amazon rain forest to a deadly prison in Madrid, Sins of the Younger Sons is a love story exposed to dire risk at every turn. JAN REID’s highly praised books include his novel Comanche Sundown, his biography of Texas governor Ann Richards Let the People In, his memoir of Mexico The Bullet Meant For Me, and The Improbable Rise of Redneck Rock. Making his home in Austin, Reid has been a leading contributor to Texas Monthly for over forty years.